The epic cross-country tour of the one-millionth Mazda MX-5 Miata continued through the heart of America with multiple stops in the Midwest. In Cleveland, more than 100 fans kicked off their Labor Day weekend early by heading to Classic Mazda to join in the celebration and make their mark on the one-millionth MX-5. 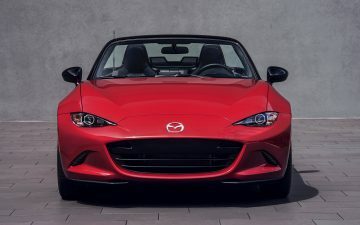 In the Chicagoland area, the Labor Day weekend didn’t stop fans from driving up to see the one-millionth MX-5 and filming brief videos about their favorite “Miata Moments” while seated in a brand-new 2016 MX-5. The Chicagoland area stop was also a homecoming for the 15th-build MX-5, as this classic red 1990 model, currently part of the Millionth Miata Celebration Tour, was one of the vehicles on display during the launch of the MX-5 Miata at the 1989 Chicago Auto Show. The Miata Clubs came out in full force at both the Indianapolis and Columbus tour stops. The Indy Miata Club paraded their prized Miatas at Tom Roush Mazda, while at Germain Mazda in Columbus, the Ohio Miata Owners and Buckeye Miata Club demonstrated their love for the iconic vehicle. To learn more about when the one millionth MX-5 will make its way closer to you, follow its U.S. journey on Inside Mazda.